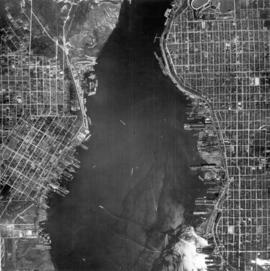 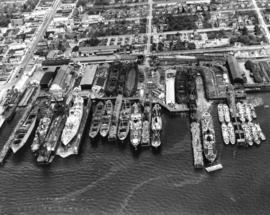 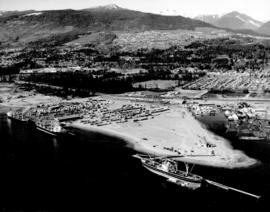 [Aerial view looking north of the] Vancouver Wharves Ltd.
Oblique view. 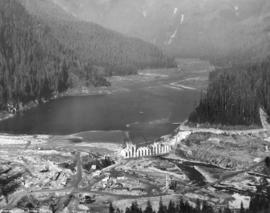 Photograph shows P.G.E. 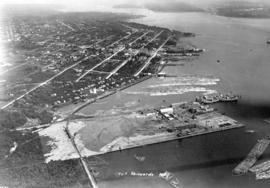 yards, L & K Lumber, Norgate waterfront and West Vancouver. 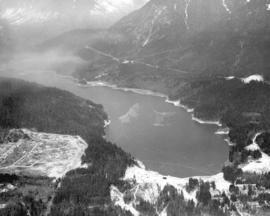 Oblique view. 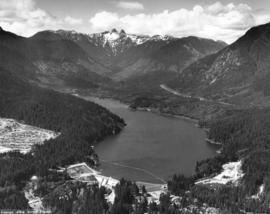 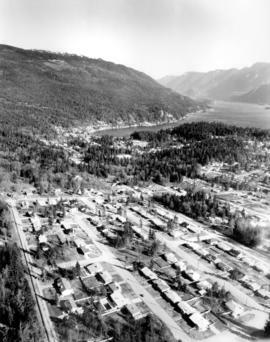 Photograph shows Deep Cove, Dollarton, Sherwood Park subdivision, Keith Road and Indian Arm. 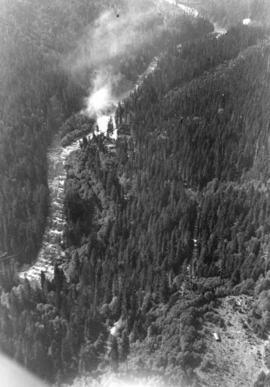 Oblique view. 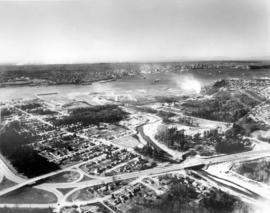 Photograph shows Second Narrows, old and new Second Narrows Highway bridge, Indian Reserve No. 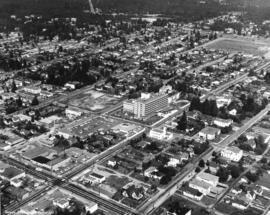 2 and Maplewood. 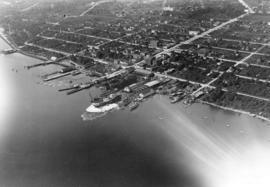 Oblique view. 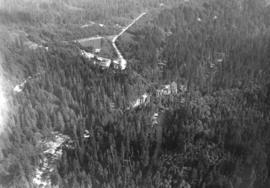 Photograph shows Fern Street overpass, Bridgeman Park, Lynn Creek and Moodyville. 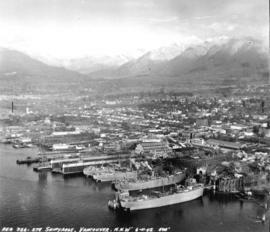 Oblique view. 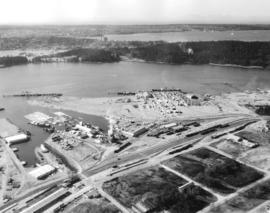 Photograph shows Norgate waterfront, P.G.E. 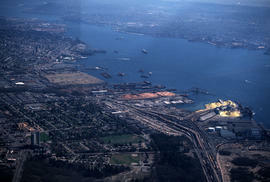 yards and sheds, L & K Lumber, Vancouver Wharves Ltd. and Stanley Park. 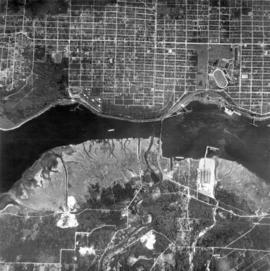 Oblique view. 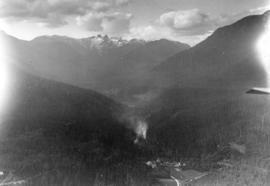 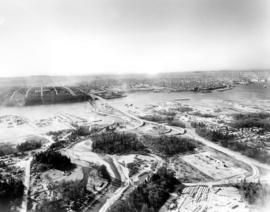 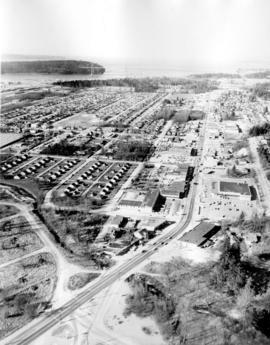 Photograph shows Marine Drive from MacKay Creek to Capilano Indian Reserve No.5, Kiwanis Senior Citzens housing, Avalon Hotel, Dominion store and the Norgate Park subdivision. 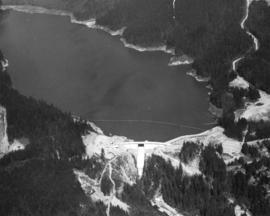 Oblique view. 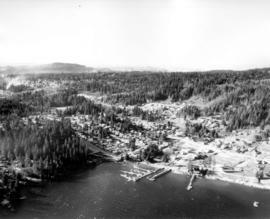 Photograph shows Deep Cove, Panorama Park, Deep Cove Yacht Club, Public Wharf (foot of Gallant Avenue), Deep Cove Resorts and Deep Cove Park. 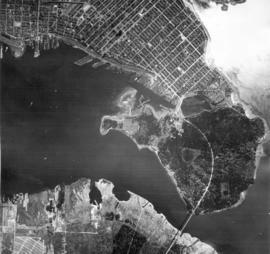 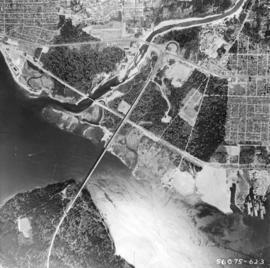 Oblique view showing "The Lions"
Photograph shows Lions Gate Bridge, Beaver Lake, Lost Lagoon, Prospect Point, Brockton Point, Deadman's Island, Royal Vancouver Yacht Club, H.M.C.S. 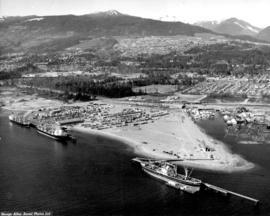 Discovery, Brockton Oval and English Bay.